Economy And Immigration: What's Dividing Republicans In Mecklenburg County, North Carolina Amid major economic development and an immigration influx, a trip to Charlotte, N.C., reveals trends within the Republican Party that are taking place across cities facing similar issues. 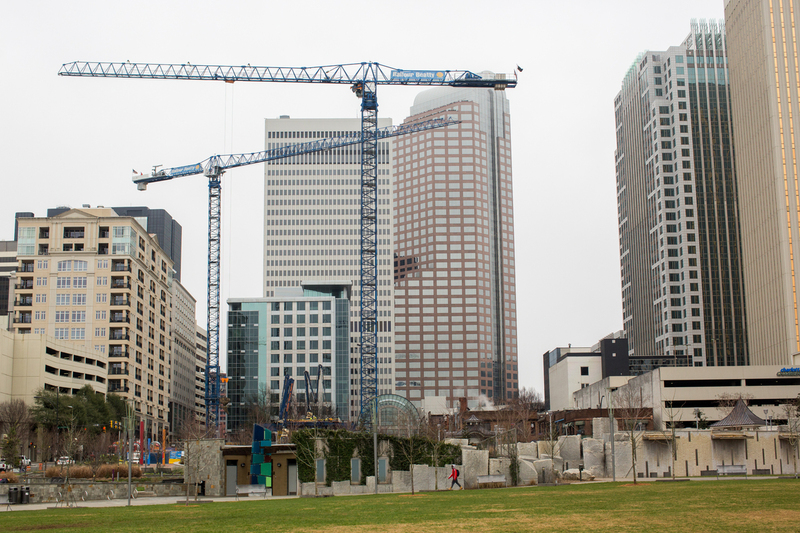 Cranes pepper the skyline in Charlotte, N.C., a sign of the region's strong economic growth. In 10 months, Americans will go to the polls to pick the next U.S. president. When they cast their ballots, those votes will likely hinge on how they feel about the issues most important to them. But what are those issues? As a way of finding out, NPR's Rachel Martin centered her focus on one community going through a lot of change: Mecklenburg County, N.C. The whole county — including its biggest city, Charlotte — has been enjoying an economic boom. It's a major center for banking, there's a growing tech sector, and immigrants have been coming to the county in growing numbers: In the 1990s, the number of Hispanics in Mecklenberg County increased by 400 percent. At the same time, a recent study out of the University of California, Berkeley and Harvard ranked Charlotte dead last when it comes to economic mobility compared with other major cities. Such changes in the county have led to debates over government overreach, income inequality and immigration — some of the same issues that are front and center in the presidential race. And that makes Mecklenburg County an interesting place to spend some time this election year. But to understand the voting population in Mecklenburg County, you have to understand how Charlotte and the surrounding suburbs have changed in the past several years. This week on For the Record: Mecklenburg County, N.C.
"This whole area of town has really started development in the last four years," says Dan Roselli, the founder of Packard Place in the center of Charlotte. His office is an old Packard Motor Cars showroom that's now part startup incubator, part community center. When asked whom he likes in the presidential race, Roselli mentions Sen. Bernie Sanders — then Hillary Clinton, Gov. John Kasich and Sen. Ted Cruz. As indicated by his diverse list of preferences, Roselli is a registered independent. When it comes to politics, the businessman says his priority is economic growth, not social issues. "Whenever I talk to political officials," he says, "the first thing I tell them is that there should be a political Hippocratic oath, which is: Your first job as a politician, when it comes to business, is do no harm." Roselli is one of the entrepreneurs who are redefining Charlotte's downtown area — but other parts of the city are changing, too. Damian Johnson, owner of No Grease Barber Shop in Charlotte, N.C., finishes up a haircut on Sam Chaney. Sam has been a client for over 10 years. 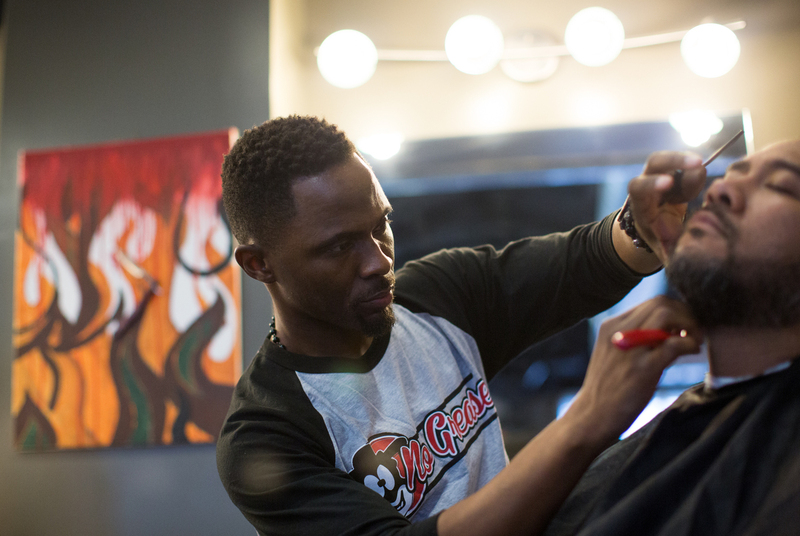 Damian Johnson and his brother opened their first barbershop in Charlotte in 1997. Now, they've got a number of them, all going by the name No Grease, including a location on the city's west side. All the barbers wear bow ties, and the place is decked out in midcentury modern furniture. It's throwback and cutting edge at the same time. "From my experience, the West End is the new frontier of Charlotte," Johnson says. "And so, when we say the West End, it's like we're rooting for the West End to take its rightful place in the development of Charlotte." Barbershops have long been a place for political talk — especially in the black community — and it's important to Johnson to keep that tradition alive. Asked whom he likes best in the presidential race, he says he hasn't committed to any one candidate yet. "I've taken none of them really seriously," Johnson says. "I'm going to listen closely to what Hillary is saying, but all the other candidates, it's like courting and dating: I have to listen to you more." Customers get haircuts on a busy Saturday morning at No Grease Mosaic Village in Charlotte, N.C.
That was the case with most of the Democrats NPR spoke with in Charlotte. They're just not animated by the primary race — which isn't surprising, considering there are just three candidates compared with the 12 on the Republican side. Take for example the former Democratic mayor of Charlotte, Dan Clodfelter, who just left office recently. He says he hasn't paid much attention to the primaries. "I already have my candidate. I don't really need to be sold," Clodfelter says. His candidate is Hillary Clinton — "always has been," he says. Mecklenburg County is solidly Democrat. More than 60 percent of voters cast their ballots for Barack Obama in 2012 in the county, compared with 38 percent for Mitt Romney. But statewide, Romney won with 50.6 percent, compared with Obama's 48.4 percent. Republicans have more than two-thirds of the seats in the state Senate and close to that in the state House of Representatives. North Carolina's governor, Pat McCrory, is a Republican. And on the GOP side of Charlotte's political spectrum, there is an impassioned debate happening over the very soul of the Republican Party. One issue in particular is driving Republican discussions here. "The word of God says, 'Be angry, but do not sin.' I am angry, very angry, with the debate on immigration," says Maudia Melendez, a local minister who's lived in Charlotte since 1987. Her family is originally from Nicaragua. Recently, she's been fighting the Republican-controlled state government to give undocumented immigrants special driving permits. It's personal, because it's her own party. "Yes, I am a Republican, but I'm very sad how the Republicans are treating my people," she says. 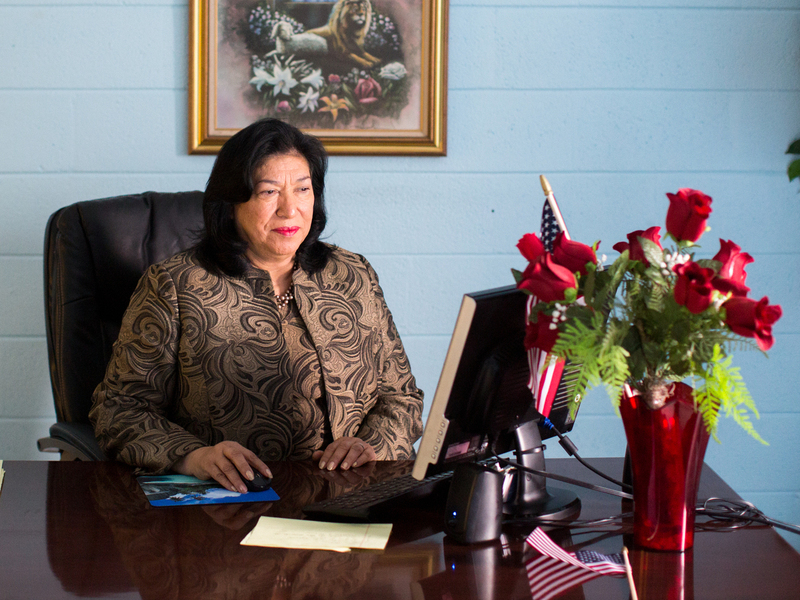 Maudia Melendez, minister at Jesus Ministry Inc., sits at her desk inside Statesville Road Baptist Church in Charlotte, N.C.
She doesn't like to brandish her party affiliation, because she works with a bipartisan nonprofit that tries to increase the low voter turnout rates among Hispanics in Charlotte. In the past 15 years, Mecklenburg County's Hispanic population has grown from 6.5 percent in 2000 to 12.7 percent in 2014. And not surprisingly, immigration was a big issue for many of the people we spoke to. At a local Salvadoran restaurant, on the east side of town, Melendez gathers a small group of community leaders and friends, two of whom — Astrid Chirinos and Rafael Prieto — say that immigration reform is their foremost focus when it comes to thinking about presidential candidates. "That's part of the economic opportunity," Chirinos says. "You don't have that, you're not going to have progress. I mean, we're going to go backwards." Ron Cox, who is also at the table, is the only non-Hispanic in the group. 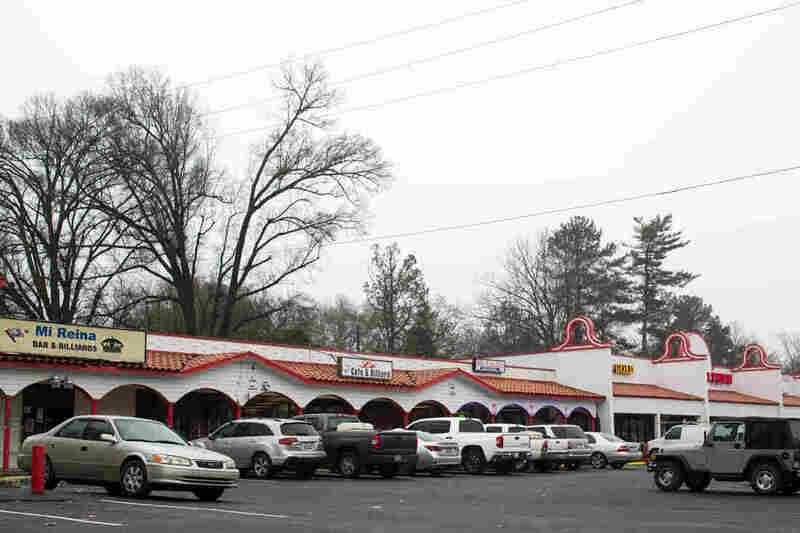 Born and raised in Charlotte, Cox opened a landscaping business and has employed Hispanic immigrants for many years. "I began to see so many of the injustices, and got to see a lot of them taken advantage of," he says. "It reached my core and my angst." He says immigration reform is also a top issue for him, but he doesn't see any of the candidates from either party proposing a real solution, because, he says, their motivations are different. Also at the table is Amelia Kennedy, who's part of the Republican Party leadership in the neighboring county. She and Maudia Melendez have been reaching out directly to some Republican candidates to talk about immigration reform — including Ted Cruz, whom they say they had a conversation with several months ago. "He wants to be president so bad that he has the same speech: 'We have to secure the border.' And we ask, 'How is it that you're going to secure the border? You have to have a plan,' " Melendez recalls. "We spent like 40 minutes with him, and we didn't get anything." The next morning, another group of conservative voters is having a very different conversation at Skyland Family Restaurant. Don Reid, a former Charlotte City Council member, has been hosting a weekly Republican breakfast here for close to two decades. There are about 50 people in the back area of the restaurant, overwhelmingly white and male. They're finishing up plates of bacon and eggs while Reid introduces some big-picture questions about the future of their party. For him, it's very clear. "Republicans have been so concerned in the past about appealing to minorities, to Latinos and others, that they've forgotten their own principles," Reid says. "And now, they are out here saying again, 'We must have the big tent.' No, that will not work. For the most part, minorities are not going to vote for Republicans. You can count on that." Some people nod their heads in agreement, but John Powell, who ran for city council as a Republican last November, puts a different opinion to the room. "I think if we go out and actually offer our hand and welcome them, and be able to supply with them a message of who we are, then that's going to educate and have a better understanding of what the Republican Party's all about," Powell says. "And what we can do to encourage everybody to be a part of the process." But it's clear the majority in the room are sick and tired of establishment Republicans and any thought of compromising on core conservative principles. Don Reid says he likes Donald Trump's plan to build a wall at the U.S.-Mexico border, and in general he's a Trump supporter. "Would I or this crowd be happy with Cruz? Yep, I think so. Would we be happy with Jeb Bush? Nope. For the first time in my life, if it's Jeb Bush or Hillary I don't vote," Reid says. "I'm not supporting establishment Republicans anymore. I'm supporting almost a destruction of the current Republican Party. ... Let them run on principle and either win or lose." The differences between Maudia Melendez and Don Reid are sharp examples of this internal Republican rift, especially on the issue of immigration. The result of this struggle could determine the future of the GOP for several elections to come. "This is extremely productive. Change only comes through pain," says Republican strategist Larry Shaheen. "And I have to admit, I think Donald Trump's great for our party. Because he is forcing us to have this conversation." Shaheen, a Charlotte native, says the Republican Party needs to broaden its base to attract minority voters — which means changing the way it talks about immigration reform. "At some point we have to get over this 'we were here first' idea. Because we weren't. And we're better as a society when we are able to find a way for rising tides to lift all boats, not just the boats that look like us," he says. "And we have to move from the party of opportunity for just a few to opportunity for all." Opportunity for all is what Charlotte is all about. We heard that from Democrats, Republicans and independents. People here want to ride this economic wave as far as it will take them. For many here, that means welcoming anyone who wants to come and help make that happen. But neither party has won over the people we spoke to when it comes to immigration policy. We'll be returning to Charlotte later in the year to check back in with some of the people you heard from today to see how their views on the election are evolving. Click the audio link above to hear the full piece. The following are some additional voices of other Mecklenburg County residents and their thoughts on the upcoming election. Wes Lawson is the 34-year-old campus director for The Iron Yard, a technology education business based at Packard Place. "I'm not hearing enough about how we are actually going to improve access to quality education and funding," Lawson says. "I'm not a single-issue voter, but I would put [education] as one of the top issues. For me, education is a workforce development necessity, it's a national security necessity, it's a quality-of-life issue." And like Dan Roselli, Lawson is not as concerned with social issues. "[We] need a government that's going to improve transportation, clean air, clean water. ... I don't need a moral voice of reason coming from an elected official," he says. Colette Forrest is the primary principal at People's Voice Management Group, doing marketing and publicity for businesses. She's a single mother and says she wants to hear some optimism for the future from candidates. She wants her 8-year-old son to be able to "further his education in an affordable school system for college and graduate school and doctorate. That he can find gainful employment after he's finished. If he wants to be an entrepreneur, he can have opportunities that are boundless," Forrest says. She says recent police shootings of unarmed black men have her thinking about her son's safety. "We've had those conversations." She tells her son, "Don't do anything threatening, don't be perceived as a threat, and most importantly keep quiet and tell them you need to call your mommy." Forrest says no candidates are talking about that issue. Vanessa Faura ran for Charlotte City Council at-large but lost. She now works as a consultant. When it comes to the issue of immigration and whether Republican candidates are offering solutions, Faura says they're breaking down a complex issue for their varying audiences. "Part of campaigning, I believe, is you've got to make yourself believable and likeable, and unfortunately in this world you're not going to be likeable to everyone," Faura says. She says candidates say what crowds want to hear, when the reality is more complicated. "That's why Donald Trump is saying what he's saying. This is why Jeb Bush is saying the total opposite. At the end of the day, I know every single one of them on the Republican and Democratic side, they know it's a lot more complex issue." A previous version of this story stated a study referenced had been produced by Berkeley University. In fact, it was produced, in part, by the University of California, Berkeley.